In a suburb of anywhere, U.S.A. local teens discover that world as gone horribly awry as all creatures great and small begin to ruthlessly attack people unprovoked. Pizza delivery boy Wolf (Greg Hoople) and his pal Jake (Adam Schonberg) realize they’re going to miss the opening night of their favorite horror series they decide to crash the party of their final addressee en route instead. What could be more fun that a bunch of young, nubile girls wasted and practically naked you ask? Wolf is about to find out as he has a very impromptu romp with the girl of his dreams Samantha (Nikki Preston) in the back of his mini-van. Wolf’s post pubescent enthusiasm gets the better of him as he’s finished before it begins. Samantha agrees to give it the old college try again tomorrow. When our protagonist awakens the next morning the wooden area is under siege by all mammals gone stark raving, blood thirsty mad. Wolf, Jake and his little sister Rachel barely make it out alive. Will our fearless and clueless protagonists find and reunite with the object of Wolf’s desire Samantha or will they fall prey to the carnivorous carnage of Rise Of The Animals? Review: Believe it or not it took some considerable pondering and deliberation to come up with exactly what angle Rise Of The Animals was shooting for. Is it a clever, misinterpreted avant garde? Is it a whimsical homage to parodies and satires of blood, gore and guts genres? Or is it a spawn of something that likely looked like a great idea on paper over a half dozen drinks and some extra incentive medicinals? I’ll allow you, the avid viewer the privilege to decide. Director and producer Chris Wojcik boasts a virtual non-existent budget of $7000 in putting together this picture. In what is destined to surely be a cult classic just by its sheer obscurity in awful special effects Rise of the Animals unapologetically and boldly goes where few dare to charter. Although the directing is suffice in the delivery of believable characters and dialogue one cannot be dramatically distracted by the copious volumes of synthetic looking buckets of blood that in all likelihood is corn syrup and water. The usage is so excessive we’re rendered to believe once again the ploy is intentional and not intended to be taken seriously. Perhaps the most hilariously absurd special effects (or more aptly lack of) are the use of puppetry to pose as the ravenous, berserk predators such as domestic cats, golden retriever and the occasional squirrel and deer. Arguably the cinematography is crisp and esthetically pleasing in HD, but the delivery is substantially muddled as each attack pans to predator seemingly constructed of old socks and plush dolls. Once again one has to be suspicious if this is an intellectual stab at PETA or some other animal rights activists. Then again the whole debacle may just be that it’s shamelessly bad. The musical score is a hybrid of trance, hip hop, dance, funk and jungle music, likely conceived on someone’s Panasonic keyboard. It enhances the goofiness of the scenes and illustrates the characters’ awkwardness well. The sound affects however are beyond lame and in no altered universe could anyone ever perceive demonic like sounds being uttered from a plush deer’s head. The set design for the most part works most effectively when shot outside. Wide angle shots of the corn fields and solemn lake are pretty much the only moments of genuine creepiness. The sheer level of barren activity contributes to a believable post apocalyptic environment. Just when you think there are some redeemable, notable elements to the film an abomination of CGI (computer generated imagery) is served up in our faces that appear so dramatically fake, it provokes the question why use the technology to begin with? Some of the female cast are easy enough on the eyes and could be construed as a welcome distraction. Samantha (Preston) appears more like a Californian p*rn starlet in training rather than a senior in high school but fans of the genre will seldom protest. Rachel (Motta) is a cute, spunky firecracker of a character that looks great as a heroine. The acting all in all had potential and could likely be better utilized in a more polished product. 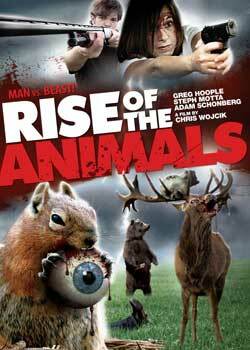 Regrettably Rise Of The Animals goes well beyond the expressions campy or tongue in cheek. I just saw this, I think your pretty spot on.